*For carder (male) in sense of carding master—so used regularly in cotton trade, and occasionally in other textile industries i>see Code No. 353.
passes wool slivers through back-washing machine, which reconditions them, by addition of oil, cleanses them, and improves their colour. makes up comber wool into balls, or tops, in readiness for spinning; attends to balling head of a gill box; stationed at back of machine, removes sliver when formed into a ball in gill box; carries balls to next machine, e.g., drawing frame; sometimes specifically designated, e.g. sliver bailer (jute). as for bailer; attends machine which winds sliver (from breaker card) into cheese-shaped balls, ready for running into finisher cards. watches second or third machine in series of wool carding machines; reports faulty work to carding engineer (353); oils machine and keeps it clean. (ii) (woollen), see bank minder. attends to delivery end of one drawing frame and feeding end of another; breaks off sliver as can becomes full; carries can to feeding end of second machine and passes end of sliver through guides. is principal attendant on a frame or machine, where more than one is employed; starts and stops machine; assisted by little tenter (399) q.v. mends or pieces broken rovings; creels bobbins, oils machine and keeps it clean by removing pieces of flax; takes away full bobbins; a general term, covering jack tenter, slub frame tenter, fly frame tenter, etc. attends to front of finisher or condenser carding engine, taking off condenser bobbins, and conveying them to mule spinning frame; cf. billy tenter (365). is employed in waste spinning mills, as attendant both on draw box (in draw frame) and on Derby doubler; mends slivers on draw frame when broken in drawing process, and feeds doubler with these slivers, which are combined therein to form a lap. watches one of a series of machines, called boxes, used in combing wool, or in preparatory processes, either a strong box, a preparing box, or a gill box; reports faulty work, bent pins, variations in speed, etc. to comber overlooker (353); sometimes specifically designated, e.g. preparing box minder. (ii) see draw frame tenter. (ii) attends to delivery of sliver from cards, and to feeding of first set of draw frames or draw boxes therewith; breaks off sliver as can becomes full and inserts end of sliver in guide of draw frame. a draw frame tenter q.v. minding second of series of draw frames or draw boxes. removes empty bobbins from boxes at back of intermediate frame, second in series of fly frame or speed frame machines, and supplies full bobbins, to be inserted in frame by creeler (399) q.v. see box minder (wool combing). card end boy, carder, card ender, card feeder (jute), card hand, feeder; takes batched jute from barrows (in which it has been allowed to stand, still retaining oil from softening process, to condition), or takes from dollop weigher (399) q.v., where weight of roving is governed from output of breaker card; spreads jute upon feed apron of carding machine and, when feeding weighed dollops, watches weight indicator to regulate amount fed. can breakera card tenter (cotton) q.v., who breaks off sliver from card at delivery end of carding engine, when sliver-can is full, and starts fresh can. sees to removal and transference of wool from one preparing box to another; when sufficient sliver is wound round roller in box, breaks-off sliver and transfers to another box. attends any one of several machines which deliver sliver into a can or draw it therefrom, i.e., backwashers, strong boxes, first gill boxes, finisher boxes, or combing machines; replaces, at front of machine, empty cans with full ones, and, at back, substitutes empty cans for full ones, breaking off sliver as can becomes full. attends feed of first drawing frame; also takes cans of sliver from finisher carding machine, and places them at feed side of drawing machine, when this is not done by can filler (399) q.v. see card minder (flax and hemp). (ii) (more usual) see finisher card ender. attends to delivery end of machine in which asbestos is carded i.e. fibres are opened out and arranged approximately parallel, knots and foreign matter being removed; watches machine for proper working; breaks off sliver as can becomes full and places end in empty can. (ii) (wool) see card minder. supplies carding, or opening out machine, with matted fibre obtained from husks of coco-nuts, and watches machine during carding process; keeps working parts clear of grease and waste fibre. (ii) in Dundee and Belfast, sometimes used in sense of carder (353) q.v. (ii) see carder (hand, hair curling); sometimes specifically designated, e.g., horse hair carder. hackles or combs curled hair after it has been opened by opener (362) q.v., and passes it over a card of finely set wire teeth, which loosens or teases out hair into individual strands; (machine hair curling), see teaser, hair. (ii) in a felt hat factory, combines duties of card feeder card minder, grinder (364) and stripper (364) q.v. spreads wool or hair evenly over brattice, or frame, of carding machine; and lifts off brat or lap as it is formed on machine. see lap feeder (on cards). puts blended wool into automatic hopper feed, or, more rarely, spreads it on lattice feed, of carding engine set, which combines processes of scribbling (coarse carding), carding (opening out strands, arranging them parallel and extracting foreign matter) and condensing (lap into sliver). places cotton lap on feed roller, and guides it into carding engine; sees that lap is in proper condition as it enters machine. general term for any worker attending to carding engine, e.g., feeding it with laps or removing slivers therefrom; includes carder feeder, lap feeder, card minder q.v. a card feeder (wooI) q.v. who lays lap on feed roller of condensing engine; usually done automatically. passes flock into carding machine; takes it out when it is carded, and puts it into mattress cases. (ii) (jute) see finisher card ender. watches machine which performs combined processes of scribbling, carding, and condensing wool (see card feeder); is stationed at back of machine; guides sliver ends into cans or on to bobbins, breaks sliver and removes filled bobbins or cans and replaces with empty ones. attends to doffer or delivery end of carding engine, mending slivers broken in carding, and removing cans full of sliver. operates combing machine, which combs out short fibres in preparation of fine cotton yarns; guides cotton laps on to rollers, starts machine, receives combed cotton, in form of slivers, in boxes or cans, and removes cans as they are filled. puts up cans of gilled sliver at back of combing machine, which combines eight or more slivers into one, and renders fibres more nearly parallel; takes away cans of sliver at delivery end, after combing, in readiness for next process; keeps working parts of combing machine free from fly or waste. (ii) comb minder, comb tenter, comber tenter, combing finisher, combing machine minder; minds combing machine, which separates short fibres of wool (noils) from long fibres (tops). tends combing machine, which doubles, attenuates, and further straightens sliver, as received from tow carding process, in preparation for further processes of drawing and preparing; breaks off sliver as cans become full at delivery end; feeds end of sliver into guides at feed end; reports faulty work to preparing master (353) q.v. combing machine minder, see comber (wool). (ii) (other textiles) see comber (cotton), comber (wool), comber (ramie). attends a machine which combines several silk slubbings into one; feeds ends of slubbings into guides at feed end; breaks off slubbing as can becomes full at delivery end. feeds and controls condensing machine, or finisher card, a final carding machine used in preparation for spinning of tow, waste flax, and hemp; as for card minder (flax and hemp). Derby doubler, doubling tenter, lap piecer, lap tenter (cotton), sliver tapper, sliver lap tenter, sliver tenter; watches Derby doubling or sliver lap machine, which unites several slivers into a sheet, and winds them on a cylinder; feeds ends of slivers into guides at feed end; removes lap rollers at delivery end. removes full sliver cans from machines, and substitutes empty ones. attends special drawing frame for doubling, i.e. combining two or more slivers, and drawing them out into one more even sliver in preparation for spinning; feeds ends of sliver into guides and breaks off sliver at delivery end as cans become full. a drawer (wool combing) q.v. engaged in drawing botany wool, fine quality wool used in worsted trade. minds a drawing frame which evens and attenuates sliver; passes slivers into feeding rollers, and watches delivery of drawn slivers into sliver cans. secures a bunch of hair, after it has been hackled, between folding boards, like covers of a book; draws it over finely set wire teeth, called cards, to remove short lengths of hair; draws out hairs of approximately equal length, either by above method or by drawing hair between thumb and a rough razor, and makes them up into lots, which he ties tightly into bunches; also sorts hair into grades, according to fineness, soundness, and colour; often also acts as hackler (362) q.v. before drawing. as for drawer (wool combing). minds machine which combines several slivers and draws or attenuates them into one spun silk sliver; as for draw frame tenter (cotton). minds machine, called a drawing or reducing box, which attenuates combed and prepared wool to thickness and weight required for roving frame; watches to ensure that there is continuous flow of wool passing through machine; joins-up broken sliver, loose rope of fibre, first stopping machine i'f necessary. feeds into guides of 'machine, called a draw or drawing frame, or draw box, ends of cotton slivers; mends slivers broken in process of combining and drawing out the slivers; attends to draft rollers and clearers of drawing frame, keeping them clear of loose particles. see front minder (cotton draw frames). see draw frame tenter (cotton), drawer (silk spinning), or drawer (wool combing). stands at front of machine which draws out and attenuates jute and delivers it in form of sliver; sees that sliver issues evenly into sliver cans; replaces cans, as they become filled, with empty ones. stands at back of drawing frame, and unites ends of sliver, and passes them in to feed rollers of frame. keeps drawing machine supplied with full cans of sliver, and removes empty cans. (ii) see draw frame tenter (cotton). as for drawer (flax and hemp). 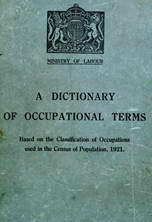 general term for any person employed in drawing department of a wool combing establishment. see drawer (under appropriate sub-heading, according to material); (jute) as for card and drawing band; for subsequent drawings,as for drawer (flax and hemp), drawing machine minder, see drawer (under appropriate beading, according to material). a dresser (silk) q.v. who minds a flat dressing machine, requiring hand setting, as distinguished from patent dresser q.v. is capable of treating horsehair and other similar hair from first to final stage; is usually a hair drawer q.v. ; sometimes specifically designated, e.g. horse hair dresser. is one of a pair of silk dressers q.v. who are jointly responsible for working of two dressing frames, who share wages jointly earned after paying wages of filler q.v., and who also do work of dresser's assistant q.v. dresses line or flax, a stage in manufacture of linen; for processes, see dresser, machine. clamps undressed fibres of Manilla hemp between folding boards, and combs out short protruding fibres; reverses fibres in boards, and repeats combing process. dresses, i.e. removes nibs and noils or short lengths from spun silk on a machine which, unlike ordinary flat dressing machine, is automatic, and does not require to be set by dressers. directs dresser's assistant and filler q.v. in opening-out degummed silk waste and placing it between inboards; sets a number of such boards in one of a series of dressing frames with protruding fringe uppermost, and removes short and ungripped fibres by bringing into contact with revolving steel comb; reverses fringe and repeats process; usually a flat dresser q.v. ; sometimes specifically designated, e.g. first framer dresser, second framer dresser, third framer dresser (according to position of dressing frame in series), machine dresser, noiler framer dresser, short framer dresser (short lengths of silk fibre. fills, turns, and empties in-boards, i.e., folding book-boards, used by silk dresser q.v. in factories where dressing process is sectionalised. (ii) see card tenter ( cotton). (Scottish term) see card feeder (wool). general terms for any worker engaged on a card, com b, gill box, back washer, or scouring machine; includes backwasher minder, breaker feeder, card feeder, condenser minder, draw frame tenter, finisher card ender, gill box feeder, lap feeder, gill rover, rover, scribbler feeder, spreader q.v. (ii) feeds drawing or roving frame with sliver. as for condenser minder (flax and hemp). (ii) (wool carding) seecard feeder. (ii) attends filling engine, which opens-up degummed silk waste for in-boards of dressing frame; puts silk on feed sheet, or creeper, and afterwards takes it from engine combs, cf. dresser (silk spinning), dresser's assistant. feeds, by hand, two finisher card machines with balls or bands of sliver received from breaker card machine. minds a finisher gill box, which delivers tops in condition ready for spinner; feeds machine with sliver, i.e., loose rope of fibre, and removes as delivered from machine. (ii) minds back (box) portion of breaker and finisher carding engines in cotton waste card rooms. a fly frame tenter q.v. . who minds slubbing frame, first in series of fly frame or speed frame machines. minds first in series of carding engines; passes hemp or tow into feed rollers, and controls power-drive of machine. general terms for a woman or girl minding a fly, flyer, or speed frame, which by action of flyers attenuates and twists cotton and winds it on to bobbins; inserts bobbins containing cotton, mends threads broken in drawing process, and takes away bobbins full of twisted cotton. a fly frame tenter q.v. who minds jack frame, fourth, and last, in series, of fly frame machines. see dresser (silk spinning) ; sometimes specifically designated according to dressing frame in series, e.g. first framer, second framer, third framer. general term for any operative minding a machine, called a frame, used for attenuating, i.e. drawing, textile materials, including fly (flyer) or speed frames, draw frames, etc. ; includes big tenter, draw frame tenter, silk dresser, finishing box tenter, fly frame tenter, intermediate frame tenter, rover q.v. pushes cotton sliver, as it issues from first drawing process, into sliver can. front of roving attendant (jute), rover, front rover; stands at front of jute roving machine, and mends threads broken in roving process by splicing, i.e., wrapping together, ends; starts and stops machine, as necessary, by hand lever; is assisted by shifter (jute preparing) q.v. general terms for an operative minding any machine furnished with gills, and used in dressing or preparing silk, e.g., a spreading, roving or setting frame, cf. spreader (silk), gill, rover; set box minder (silk). minds a gill box, which treats several wool tops collectively in such a way as to produce a sliver of uniform weight and density, in preparation for drawing process; feeds ends of sliver from top into guides of machine, joins up broken slivers and generally watches proper working of machine. keeps gilling machine (which unites several slivers into one, for greater uniformity of substance) supplied with sliver in sliver cans. hackles and combs coco-nut fibre, by hand; draws a handful of fibre across pins of a series of hackles and combs to remove short and irregular fibres, and to straighten out and level the ends of longer fibres. places material in hopper of carding, drawing, or other machine. a fly frame tenter q.v. who minds intermediate frame, i.e. second in series of fly (flyer) or speed frames. (ii) (wool) minds intermediate carding machine between scribbler and condenser; pieces up broken rovings; oils machine and keeps it clean of flax. see fourth bobbin and fly frame tenter. a strong box minder q.v. in charge of first, or preliminary, combing machine, after passing through which wool is usually dyed and then re-combed. is one of a pair of operatives who share work of minding draw frames, flyer frames, or other machines, and divide their joint earnings equally or in agreed proportions. places cotton lap from scutching machine on feeding end of carding machine. (ii) connects new lap with end of old lap, already in machine. takes lap from carding engine, and either folds it or guides it on to winding beam; carries wound or folded lap to next machine in order of process. puts material on lattice feed attachment of any machine. see spreader (flax) ; cf. layer (365). keeps carding and preparing machines supplied with wool. general terms for worker tending any machine which prepares fibre for spinning, including spreader, drawer, rover, q.v. ; cf. preparer (362). as for preparer (flax, hemp, jute). places long-fibred silk waste in position at back of preparing machine, and passes it between rollers, from which it is automatically taken through machine and wound upon an endless apron. punches or balls wool slivers, from first gill box, after backwashing process, by coiling or rolling them on a special punch box, in preparation for combing. see drawer (wool combi rig). takes silk after it has been formed into a lap by spreader q.v., and passes it through another machine, similar to spreading machine, called a re-lapping box, to level up lap. guides cotton between rollers of ribbon lap machine, which produces uniform lap for combing machine; starts machine, using pressure rod for making first turn of lap. guides asbestos fibre through roving frame, which twists and attenuates it in preparation for spinning; attaches it to roving bobbins; controls power-drive of machine, and mends fibres broken in roving process. a fly frame tenter q.v. who minds roving frame, being third in series of fly frame or speed frame machines. minds dandy roving frame, which further attenuates and twists slubbing from gill roving frame, and winds resulting rovings on to bobbins; places bobbins on rover; feeds machine and takes off full bobbins. minds a roving machine, which twists and attenuates line or tow in readiness for spinning process. feeds gill roving frame with sliver from drawing boxes which is converted into slubbing by further attenuating it and imparting some twist thereto; winds slubbing on to bobbins, ready for dandy rover q.v. minds roving frame, last in drawing series, immediately preceding spinning, which advances wool to condition of roving, or loosely twisted cord of wool; inserts full bobbins, from drawer (wool combing) q.v., into frame; guides sliver end through machine and attaches to roving bobbin; starts-up and stops frame as necessary; mends broken roving ends; doffs full roving bobbins and replaces with empty. see rover, according to material. a card feeder (wool) q.v. who spreads wool lattice of scribbling machine, the first of a series of three carding machines. see card feeder (wool) ; cf. server (silk) (399). minds set or run-over box, which converts lap, after passing through spreading and re-lapping boxes, into a sliver. replaces full bobbins by empty ones on carriage of roving machine and gives ends of rove a twist round bobbin. a card tenter or can tenter q.v. who breaks off sliver from carding engines or drawing frames when sliver can is full; removes sliver can and starts fresh can; cf. can boy (399). see first bobbin and fly frame tenter. a fly frame tenter q.v., able to take place of any fly frame tenter absent through sickness, & c.
a gill box minder q.v. in charge of a spindle gill box, which, besides drawing, winds wool upon bobbins. see spreader (flax and hemp). (ii) spreads cotton on feeding apparatus in blowing and scutching room. as for spreader (single), but performs whole series of operations without assistance. spreads fibre on one of parallel sections of travelling band which feeds spreading machine; overlaps fibre ends, thus forming continuous ribbon of fibre. as for spreader (flax and hemp). converts dressed fringes of spun silk into a continuous rope: pieces fringe ends together, and passes them between rollers, which wind them, in form of a lap, round a drum. covers a long board with pieces of flax or hemp, each piece overlapping piece before it; holds material thus arranged in position on board, while another spreader draws or attenuates it, forming it into one continuous thread, or sliver. feeds carding machine with hair which has been opened by opener ( 362) q.v. and controls carding machine during operation of carding or teasing. lays armfuls of wool on feed plate of opener carding machine in manufacture of felt. passes cotton waste through willowing and carding machines, which open out fibres to form lap; places lap rollers in gumming machine and watches gumming and drying process on creeper or lap conveyor through drying chamber. minds and feeds machine extracting dirt, hard ends, or other impurities from cotton waste. watches weigh box drawing machine, which stops automatically when a certain length of slubbing has been delivered; may guide ends of slubbing into machine and break off slubbing and remove full bobbins at delivery end. puts wool into carding machines, in manufacture of felt for hats.